Beautiful 4 Bedroom, 2 1/2 Bath home in Winchester Acres with 2,259 square feet of finished living space. This home is move-in ready and boasts the style, function and space you want. This home features an open floorplan with lots of natural light, vaulted ceiling and neutral colors. The large eat-in kitchen perfect for gatherings boasts lots of cabinet and counter space, stainless steel appliances, recessed lighting and sparkling hardwood floors. Retreat to the 1st floor Master Bedroom w/ Master Bath and walk-in closet. A Half Bath and Laundry Room complete the main floor. The second floor features 3 large Bedrooms, a Full Bath and a spacious Loft Area perfect for an Office or Game Room. Endless possibilities in the unfinished basement with 1,543 square feet of space. 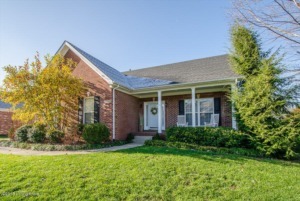 Great Home in a Great Neighborhood close to award-winning schools, shopping and major highways!